The cake, Genevieve’s dress, Charmagne’s dress, Kaitlyn’s dress, Grace’s dress and Barbara’s outfit were all make by Charmagne. Charmagne also designed all the dresses and pattern drafted them. She also designed the Maiden Daughters dresses and made a pattern for each individual girl and cut out all their dresses and made up two of them. Thanks Christmas Wedding 2008. Our daughter Charmagne did a great job. 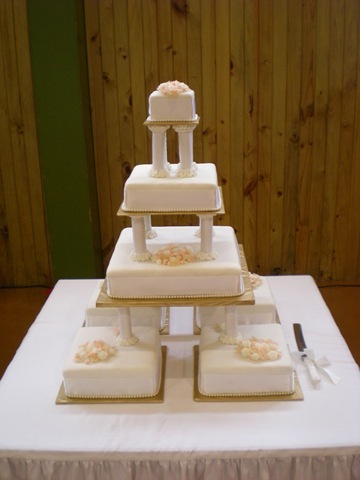 It is 7 fruit cakes which were made 2 months before the wedding. Then Charmagne put on a layer of Almond icing, then a layer of white icing a week before the wedding. All the rest was done the day before the wedding when we were setting up the for the reception.